This tutorial explains how to setup the IPS system to drop SSL certificates listed on the abuse.ch SSL Blacklists & Feodo Tracker. Minimum Advisable Memory is 2 Gigabyte and sufficient free disk space for logging (>10 GB advisable). After applying you need to reboot OPNsense otherwise offloading may not completely be disabled and IPS mode will not function. Some features described on this page were added in version 16.1.1. Always keep your system up to date. To enable IDS/IPS just go to Services ‣ Intrusion Detection and select enabled & IPS mode. Make sure you have selected the right interface for the intrusion detection system too run on. For our example we will use the WAN interface, as that will most likely be you connection with the public Internet. First apply the configuration by pressing the Apply button at the bottom of the form. For this example we will only fetch the abuse.ch SSL & Dodo Tracker rulesets. To do so: select Enabled after each one. To download the rule sets press Download & Update Rules. 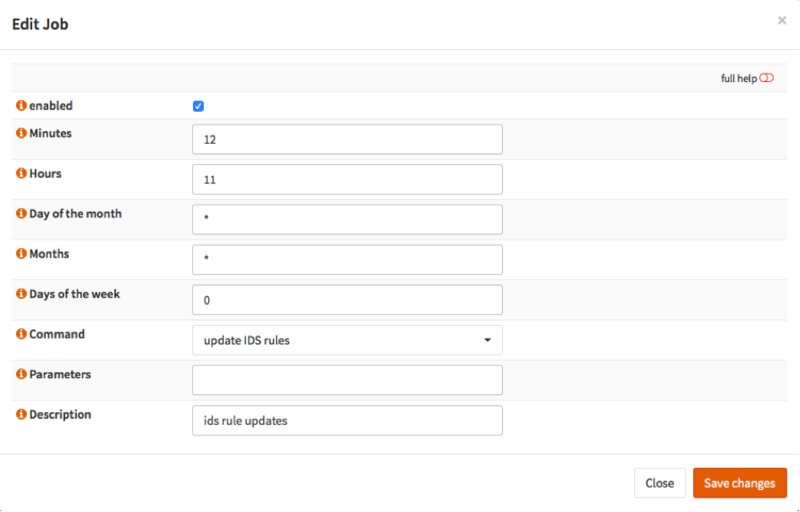 Now click on the info button right after each rule and change Input Filter from none to drop actions. Now press Download & Update Rules again to change the behavior to drop. Now schedule a regular fetch to keep your server up to date. Select enabled and choose a time. For the example it is set to each day at 11:12. Select Save changes and wait until you have returned to the IDS screen. Your system has now been fully setup to drop known fraudulent SSL certificates as well data phishing attempts by utilizing the Feodo tracking list.